JOHANNESBURG, South Africa, April 27, 2012 (ENS) – The world’s smallest viper, now classed as Vulnerable to extinction, has been discovered in greater numbers than previously known and will soon be upgraded on the IUCN’s Red List of Threatened Species, according to the scientist who has studied these tiny snakes most closely. Bryan Maritz of the University of the Witwatersrand’s School of Animal, Plant and Environmental Sciences, has spent years studying the Namaqua dwarf adder, Bitis schneideri, as the focus of his PhD thesis. The average length of these tiny snakes is just 200 millimeters (7.87 inches) and they weigh less than 38 grams (1.34 ounces). 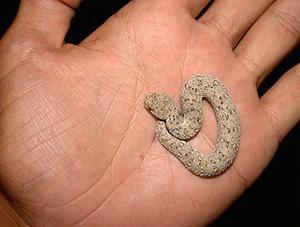 The Namaqua dwarf adder is found only on the sand dunes of the Namib Desert and in the Succulent Karoo biome, the world’s only arid biodiversity hotspot. The vipers live in an area that straddles southwestern Namibia, south of the harbor town of Luderitz, and extends into the northern part of South Africa’s Western Cape province. This small area is composed of sparsely-vegetated sand dunes extending from five to 20 kilometers (three to 12 miles) inland. Most of the area was off limits until recently due to diamond mining activity, but the de Beers Corporation, which owned much of the land, has donated large tracts to the South African National Parks Board. Limited tourism is now permitted in the area. On the African continent, where fewer than 20 studies on the ecology of snakes have ever been conducted, Maritz became interested in the little viper’s limited range and the question of its survival as a species. Maritz spent three summers from September 2007 to March 2010 living an idyllic Robinson Crusoe life in old diamond divers’ cottages, walking the desert sands to find and better understand the viper. “Someone had to do it,” he says with a smile. He found approximately eight individuals per hectare (2.5 acres) and so concludes that the snakes are not vulnerable to extinction. The abundance of these vipers raised a host of questions for Maritz, including how and why they have adapted to such a limited area and what allows a snake so small to survive in such a harsh environment. Most common radio transmitters are too heavy for the snakes to bear, but Maritz resolved this problem with miniature transmitters that he placed near the snakes’ tails with super glue. During moulting, the adders shed the transmitters along with their skins. Maritz has found that the viper’s adaptation to the desert sand is more important in explaining its size than the relative scarcity of prey in this arid habitat. The region is populated by a unique set of plants and animals that are dependent on the rich Benguela current that flows offshore. Rainfall is limited to 50 – 150 mm per year. Despite wild fluctuations during the day, temperatures remain between 18.2 C in summer and 14.3 in winter. Due to the regulating effect of the Benguela current on the desert climate, Maritz found that Namaqua dwarf adders can hunt year round and do not stop eating through the winter months as most other vipers do. It is this ability to hunt and eat that allows Namaqua dwarf adders to reproduce every year unlike their viper relatives, which breed every second year. Annual reproduction means that Namaqua dwarf adders can sustain their numbers despite producing only four or five young in a year and despite the low survival rates of the young due to predation by other desert animals and birds. Maritz says the other key feature of the vipers’ survival strategy lies in their diurnal habits. Most closely-related vipers are nocturnal, while the Namaqua dwarf adder hunts during the day and occasionally at night. It wastes no energy hunting but lies partially concealed in the sand to ambush its prey – lizards, rain frogs, pygmy mice, and other small creatures. 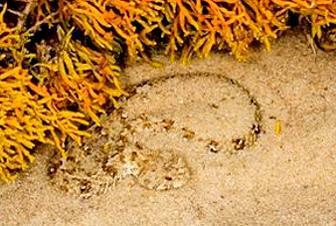 Maritz believes this ability to burrow into the sand and remain nearly invisible has played its role in determining the size of the Namaqua dwarf adder. If it were a larger snake, its ability to hide itself in the sand would be limited, he says. The moisture-laden clouds that roll over the desert in the morning leave a residue of water that sinks into the sand, dampening it below the surface. This enables Namaqua dwarf adders to “thermoregulate” enough to stay just below the surface of the sand while they wait for prey, he says. Only during the spring mating period, September to November, do the males travel, hunting for mates. Although the distances Maritz measured averaged just 50 meters (164 feet) per day, he says this is a long journey for such a small-bodied animal. The viper’s bite is not very dangerous to humans but can kill prey over 100 percent its own size. The 22 road kill snakes Maritz found with the help of local friend Bruce Wessels allowed him to examine the stomach contents of the snakes and assess their reproductive status. It was the discovery of a dead viper with a dwarf chameleon in its stomach that provided Maritz with the clue to the year-round hunting habits of the snake. In all, Maritz captured 285 live snakes and marked each one with a ventral scale clipping to ensure that he was not recording the same snakes repeatedly. 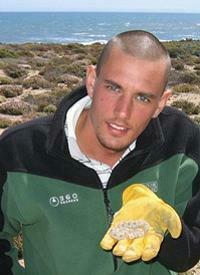 He recaptured 54 of those snakes, which allowed him to estimate population size, survival rates and growth rates. Conducting the research was more like an extended holiday, Maritz says. He enjoyed diving expeditions in the sea, beach rambles and the beauty of the Namaqualand Coast to offset his daily two-to-five hour hunts across the burning sands for the snakes and their trails. “Many more should study the incredibly rich herpetological treasures of this continent,” he says. Maritz is about to embark on a post doctoral fellowship in New York and will be focusing on much larger snakes for a change, mapping the distribution and ecology of vipers in the eastern United States.